With the advent of the 100 Centenary of the Royal Air Force in 2018 I decided now was a good time as any to dig out my digital crayons and produce a new print to commemorate this historic occasion. 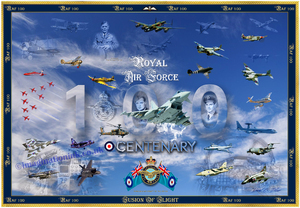 One hundred years is a long time scale to encompass all the elements that make up the Royal Air Force since its birth in April 1918 by its founder 1st Viscount Hugh Montague Trenchard GCB, OM, GCVO, DSO, fondly known as the Father of The Royal Air Force. The real stars of the Royal Air Force are of course the aircraft themselves, so many different types of aircraft and their variants have spanned the decades so it was a difficult choice of what to feature in this new print and what to omit from it. We all have our favourites, so my final choices are not necessarily going to please everyone but the ones I have chosen I think give a favourable impression and representation of the aircraft that spring to mind when people think of the Royal Air Force. The print would not have been complete without including some of the famous airmen who flew some of these aircraft and my only real indulgence and artistic licence in this is that I have included one of my boyhood heroes, Wing Commander Guy Penrose Gibson VC, DSO & Bar, DFC & Bar famed for the Raids on the Dams (Dambusters) in 1943. Another name that springs to mind from this era is of course the famed Group Captain Sir Douglas Bader CBE, DSO & Bar, DFC & Bar, DL, FRAeS, fighter ace of WWII, a quite remarkable man in so many ways. My trio of airmen would not be complete without the inclusion of the Father of the Air Force, Viscount Trenchard. The print itself comes in full colour and measures 29.7 cms x 42.0cms (A3). The image shown here is of a low resolution. For those wishing to purchase this print, the final image comes in a larger resolution with greater clarity and more defined in colour, minus the watermark. (The print ‘FUSION OF FLIGHT’ still comes with a copyright).Supply of the print is by DIGITAL DELIVERY ONLY, direct from me, saving on costs and giving people the option of having the choice of using their own means of printing method (Home, high street, or professional online). 2. Once received in your INBOX the file can then be saved to your computer/laptop/device. 3. The file can then be uploaded to any online printing company or saved to any memory stick/copying device and taken to any High Street Store/Mall for printing. 4. Please be aware the copyright belongs to me via www.imaginationink.co.uk. THANK YOU.